Catsparella: Friskies Creates Music For Cats, But Will Charlie Listen? Friskies Creates Music For Cats, But Will Charlie Listen? Charlie is a cat of many strong opinions. Likes include belly rubs, treats that don't fall out of his mouth, and sniffing Priscilla when she's not looking. Dislikes include when I kiss him too much, going to the v-e-t, and Priscilla getting too much attention. When Rhett and Link made a commercial for cats back in June, Charlie watched and gave it two paws up. I recently heard that Friskies released something called Cat-acoustics, "music tracks for cats," and knew that my pop culture pussycat would be the purrfect critic to put the tunes to the test. In partnership with Pet Acoustics, a company dedicated to creating music products specifically for pets (who knew this even existed? ), Friskies developed six "unique musical tracks to inspire cats to play." 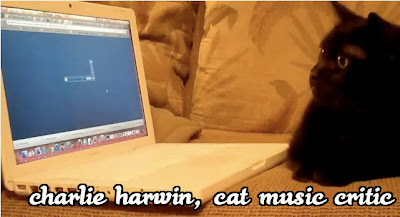 New songs will be released quarterly through June 2012, with the two current offerings - "Purrfect Day" and "Paws for Treats" - available now as free downloads on the Friskies website (Charlie is listening to "Paws for Treats" in the clips below). The two tracks elements of percussion are made by Friskies toys, food, and treats; and include "stimulating frequencies" that are supposed to bring out your cat's inner-kitten. Test #1: He was briefly interested, but fled the scene once the meowing and purring started. Test #2: Charlie could definitely be described as a playful cat, but did the music "inspire a playful response" as promised? Janet Marlow, CEO of Pet Acoustics says, "Until recently, most music created for animals was based on human likes and dislikes. We just assume what pleases humans, pleases our pets. The Friskies tracks are intended to stimulate play for cats and are tailored in rhythm, flow themes and bandwidth based on feline hearing ranges." The folks at Friskies are a forward thinking bunch, and were also the first cat food company to create free downloadable games for kitties (I don't have an iPad, but both of my cats are a fans of Cat Fishing on my laptop). I wonder if their marketing division is run by cats? Check out the Friskies website to stream or download the two musical tracks for yourself, and let me know what your little music critics think! This is really interesting, and it makes sense. Kudos to the folks at Friskies for thinking to create something that includes the super high frequency sounds that cats can hear!